Kiwi stayer Megablast has recovered from a minor leg injury and is fit to take his place in the 2018 Listed $175,000 Scott McMahon Electrical Caloundra Cup (2400m) at the Sunshine Coast on Saturday. Damian Browne, above, rides Megablast in the 2018 Caloundra Cup at the Sunshine Coast. Photo by Daniel Costello. The Nigel Tilley trained Megablast was forced to miss the Group 2 $300,000 Pages Hire Brisbane Cup (2200m) on June 9 and the Group 3 $200,000 Lazy Yak Tattersall’s Cup (2200m) last Saturday, both at Doomben, because of a minor leg injury. The six year old grey hasn’t raced since finishing third behind Egg Tart and Tradesman in the Group 2 $200,000 Bradford Access Insulation P.J. O’Shea Stakes (2200m) at the Sunshine Coast on June 2, but Tiley said that he is fit to line up for his first run in a month after sustaining a knock to his sesamoids in his front leg. “He knocked a sesamoid, which is why I had to scratch him out of the Brisbane Cup,” Tiley said. Tiley said that Megablast was given the all clear last week following extra scans and x-rays. “We scanned and x-rayed him again and got the all-clear so we are good to go,” Tiley said. Megablast is on the second line of betting at $3.80 for the Caloundra Cup with Ladbrokes.com.au behind the Darren Weir trained Tradesman who heads the market order at $3.40 while the third favourite Nurse Kitchen has been scratched and will run in the Listed $125,000 Winter Cup (2400m) at Rosehill on Saturday. 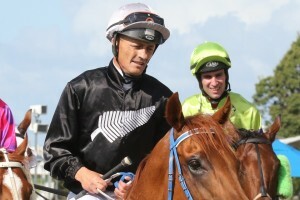 The Chris Munce trained First Crush is now on the third line of betting at $8 just ahead of Smart As You Think at $10. The scratching of Nurse Kitchen means that Megablast will now jump from gate nine in the fifteen horse Caloundra Cup field with Damian Browne in the saddle again.